A romantic massage can be a wonderful way to show affection. The right atmosphere will assist in relaxation, melting stress away. It doesn't take much time or money to transform an ordinary room into a romantic spa getaway. Give your sweetheart a massage yourself or set up a room for a couples massage and hire a professional masseuse. Treat someone special to a romantic massage. Set up a massage bed. If you do not have one, the floor can work as a surface for a massage. Refrain from using a regular bed as it can be too soft and result in discomfort for the person on the receiving end. It is important to be able to move around the person getting the massage, and a regular bed can get in the way of this. 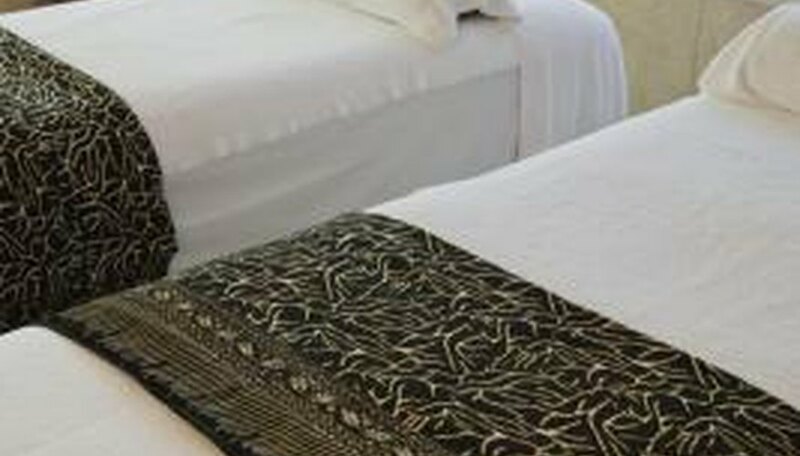 If using the floor, lay a neatly folded sheet and pillow on the floor. Sprinkle rose petals over the massage bed or sheet. Red rose petals are the traditional symbol of romance, but other colors can be used as well. Scatter the petals all over the bed or sheet. To get creative, place a trail of rose petals leading your sweetheart to the place where the romantic massage will take place. Place candles of different heights throughout the room. This will create dimension with the lighting and make for a decorative touch. Opt for scented candles in fragrances such as vanilla or pumpkin. Small tea-light candles also can create a sensual atmosphere when many are in a room. Place a plate of gourmet chocolates by the massage area. Turn light-instrumental, spa-friendly or sensual music on at a low volume. With music too loud, it can be difficult to relax. Mix a few drops of an essential oil with a carrier oil, such as almond oil, and place by the massage bed for use during the massage. There are many essential oils to choose from and each one can bring about a different reaction. For example, rosewood, sandalwood and ylang-ylang are known for being sensual and seductive. A few essential oils that aid in relaxation are calendula, chamomile, jasmine, lavender and rose. Miller, Pamela. "How to Set Up a Room for a Romantic Massage." Dating Tips - Match.com, https://datingtips.match.com/set-up-room-romantic-massage-2166759.html. Accessed 19 April 2019.